If Donald Trump, in kicking off his campaign for the White House, was saying “what everyone is thinking” about illegal immigration, it must be that his message mirrored a narrative that already existed in the minds of his audience. That fearful story of criminals invading the U.S. borders has long been a dominant theme in the mainstream news immigration story. Like all news stories, this one focuses attention on some facts at the expense of others. Like many news stories, it draws its power from earlier, well-known tales–some as old as The Flood. This article reconsiders news stories–and the storytelling role of journalism–in light of a relatively new approach to conflict resolution: narrative mediation. 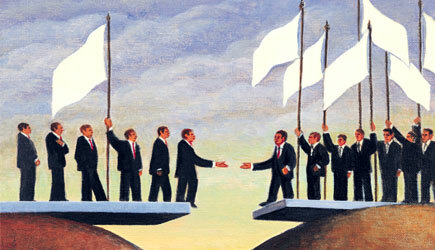 Narrative mediation, simply stated, sees conflict as a kind of story. Narrative mediators approach a conflict by calling its story into question and then by looking for facts that fall outside of its plot. They use these “unstoried facts” to explore the alternative stories that such facts suggest. Then, narrative mediators try to help the disputing parties write a larger, more complex, and more useful story together. This article recommends that journalists adapt certain processes of narrative mediation to thicken the plots of news stories, producing more comprehensive, accurate, and helpful accounts of the conflicts they cover. Although this article focuses on news coverage of immigration from Latin America, the approach of narrative mediation can be applied more broadly. Immigration conflicts are not confined to the U.S.-Mexican border or to the issues of legal status and documentation that arise there. Fearful storylines are also used in reporting conflicts over legal Muslim immigrants, including the most extensively documented of all recent arrivals, Syrian refugees. The same narratives sound again overseas. Beyond the immigration story, and across other reporting beats, narrative mediation offers tools to disrupt predictable news storylines that can result from political pressures and deadlines. These tools can free reporters to construct the stories of news in a thoughtful and deliberate way.